Cuddling with my kids is my favorite! I mean truly...isn't that the best part of motherhood? At the end of a long day of laundry and dishes and kids going crazy... what better way to relax than to wrap them up in your arms and just enjoy those sweet moments together. Thankfully, both of my kids still love cuddling too so while I know it won't last forever, I plan to celebrate every last moment that it does. After all, they're my little cuddle bugs--- a term I've used since they were itty bitty babies! It may have simply been the name that drew me in, but it was the story that made me realize exactly why this sweet book has ranked on the Children’s Bookscan Juvenile Overall and Juvenile Overall Fiction bestseller lists! It's absolutely adorable! 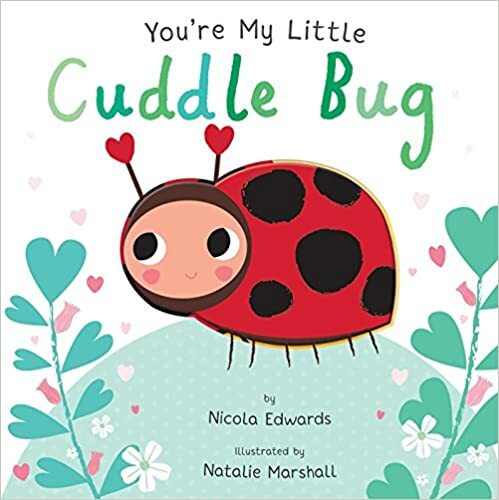 Each page we meet another cute new bug and are introduced to more sweet rhymes that show perfectly the the love between a mother and her baby. (Of course, 'mother' is not actually specified so it could be a great choice for any parent, grandparent, etc as well). My daughter and I loved flipping through the pages to see them all. The die cuts gave them a fun 3D look and feel that made it even more exciting. This book truly is a sweet book that is perfect for those cuddly moments! In fact, we loved the story so much that we decided to bring it to life with a fun craft, creating our very own cuddle bugs! First and foremost you will want to choose the type of cuddle bugs you would like to create. 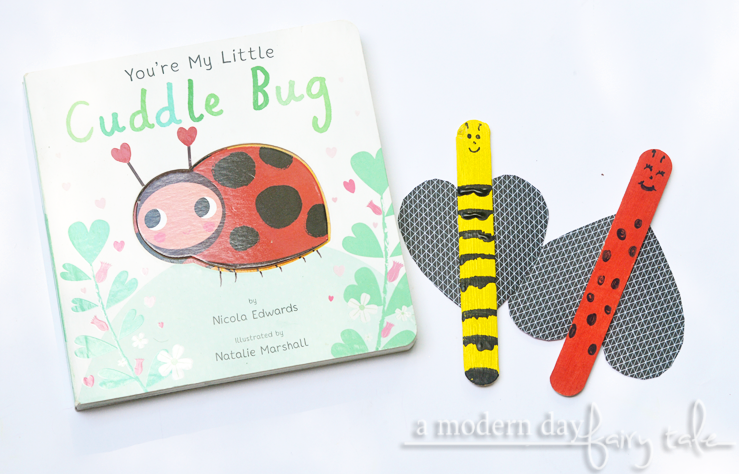 The book features 5 (lady bug, bumblebee, caterpillar, butterfly and firefly), you can create all to act out the story, pick your favorites, or come up with your own unique cuddle bugs too! Now, it's time to paint the sticks. I like using the larger craft sticks for these types of projects as I find them a little easier for little hands, but small work fine too. Paint as desired for your bug of choice, remembering to include an area for the face. Allow to dry. Cut your wings. For the butterfly, handprints can be a fun idea to make them more personal. 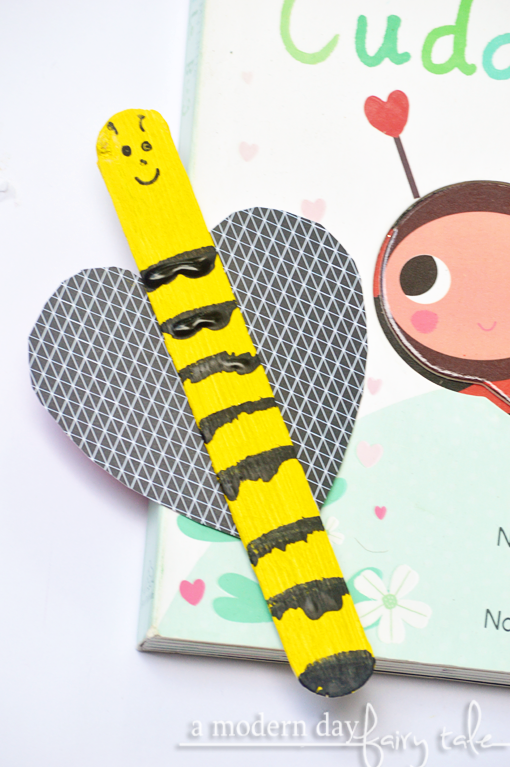 For the other bug varieties, I've found cutting a heart is a cute and simple way to create the wings. You can use whatever paper you have on hand. Construction paper is ideal, but if you only have white, just allow the kids to decorate! Use scrapbooking paper for some fun designs too! Glue on the wings. Use a hot glue for quick and easy drying, or if using craft glue, give time to dry thoroughly. Add finishing touches. Go back in and draw on the faces or add googly eyes. Have fun with stickers or markers on the wings... whatever you want! Super simple, right? 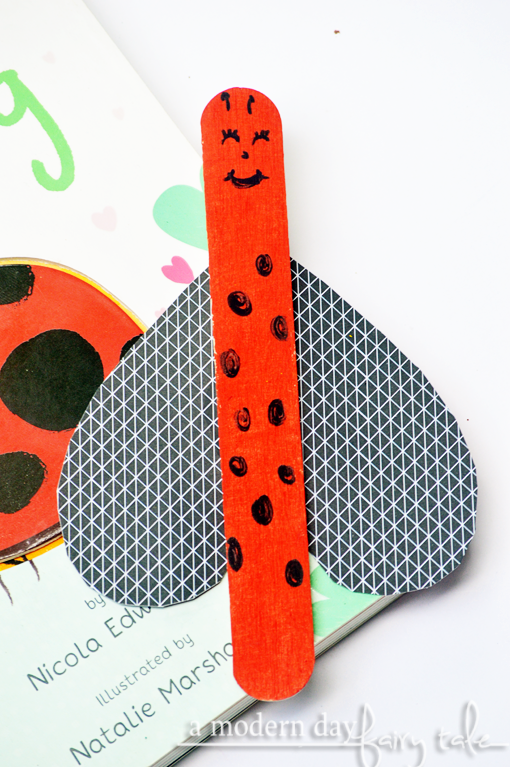 These fun crafts are such a cute and simple way to bring this already fun story to life! And making reading fun...? Isn't that what we all want? Want your own copy to enjoy with YOUR favorite cuddle bugs? It is available to purchase now at your favorite book retailers. What a cute book to read to my five year old grandson, that little guy loves having his grandma read him all sorts of great story books. And I love that he is really into reading too.